A friend encouraged me to read this series of books, and, at first, I was reluctant to do so. I have read and loved Carla Kelly’s regency romances and historical romances, but New Mexico in the 1700’s? Hostile Comanches? Uncivilized living? Not for me, I thought. Boy, was I wrong! This is truly some of the best historical fiction I have read, and I’m going to combine my thoughts of the three books into one review. 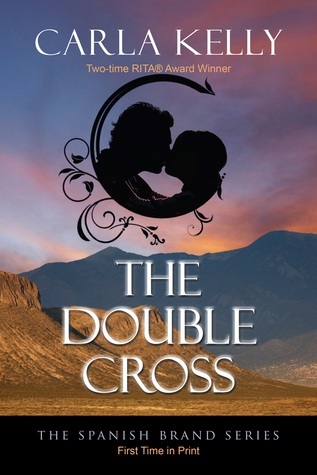 THE DOUBLE CROSS is the home of Marco Mondragon, a thirty year old man who lost his wife and young sons to cholera when he was only twenty three. Since then, he’s lived a very lonely life. Now he’s accompanying his friend on a visit to meet his friend’s betrothed. He also intends to purchase a small dog from them, one who’ll be a companion for him, and keep his feet warm on cold nights in his lonely bed. His friend’s fiancee has a cousin named Paloma, who is treated as a servant, rather than family. Paloma is an orphan, whose family was slaughtered by Comanches, while she remained safe because she was hidden by her mother. While he finds her interesting, Marco doesn’t pursue any further contact. But fate and a small yellow dog have other plans. Marco and Paloma keep encountering each other and soon the lady with the beautiful blue eyes and the gentleman with the light brown eyes decide to marry. As Marco’s and Paloma’s fledgling love grows, they are very happy. Paloma is starting to gain weight from the near starvation her relatives subjected her to. Marco is trying his best to overcome his fear of leaving Paloma alone at the ranch, remembering what happened to his first family when he was away. Soon, there is a new threat – smallpox. Marco has been inoculated, but Paloma has not. A self-proclaimed doctor arrives in town, willing to give the vaccine to Marco’s household, but at a very steep price. 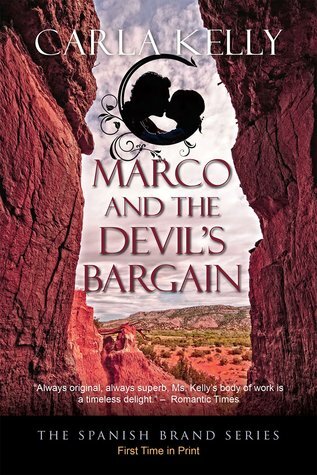 In MARCO AND THE DEVIL’S BARGAIN, Marco must venture into Comanche territory to help the doctor find his daughter, who had been kidnapped. Paloma refuses to stay home, and insists on going along on the journey, despite her great fear of the Comanche people. This journey takes them through danger and hardships. It also lets Paloma and Marco discover that Comanche are just people, and can be friends. One Comanche, Toshua, whose life was saved by Paloma, has appointed himself as her guardian. His help becomes invaluable in saving their lives. Marco and Paloma have finally been blessed with a son, in addition to their adopted daughter. There love has steadily grown, and they are deeply in love and very happy. There is now actually a tenuous peace, until Great Owl, a renegade Comanche, begins to stir up trouble. Though the last thing Marco wants to do is leave the ranch, he knows that Great Owl must be stopped now, or they will never be safe. In PALOMA AND THE HORSE TRADERS, Marco and a small band of men, greatly outnumbered, use all their cunning to face and outsmart a strong, and seemingly undefeatable enemy. 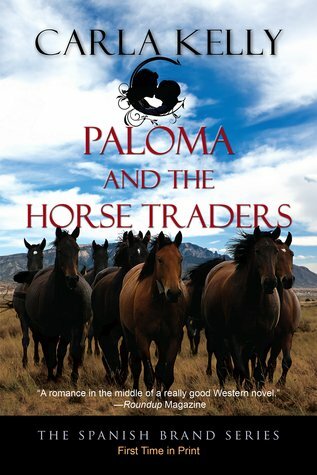 And the horse traders surprisingly bring a priceless gift to Paloma, one she never could have expected. Life was very hard during this time. Between them, Paloma and Marco have suffered tragedy, abuse, loss and grief. Together, they have truly become one as they share a beautiful and strong love. They grow and learn and thrive. The SPANISH BRAND SERIES weaves a lot of historical information into Marco’s and Paloma’s love story. Carla Kelly doesn’t shy away from the harsher aspects of life, yet these stories are fast paced and exciting and beautiful. There is subtle humor as well, the kind I enjoy, humor that doesn’t hit you over the head, but nibbles at you, causing you to smile. Every book here is a winner, and a keeper. All receive my highest recommendation.